The movie starts off as one of the best michael bay films in years, but loses its way the longer it goes on. Pain and Gain starts off promising, reminding us why Michael Bay is where he is as a filmmaker and that the guy does have talent after all. that’s because this is the best kind of movie he can be making (a realistic crime film), and he pulls out all the stops. Those include fantastic looking visuals and the use of voice-over to put us into the heads of the characters. Bay is able to keep that momentum going for about half of the movie, not even losing us when the comedy falls short of it’s mark. but then something happens and it all starts going downhill fast. There are definite problems with this movie, starting with it’s weak story, and the longer the film goes on, the more those problems are exposed and made obvious. Pain and Gain starts out pretty good. By starts out, I really mean it stays likeable for about the first hour or so of the movie. That’s because in that first hour, we get to see director Michael Bay’s talent. It has been hidden from us for about a decade now, lost in the mix among his Transformer movies, which are a combination of over-the-top special effects, awful humor, and terrible storylines. But bay is a skillful filmmaker, or at least he was, back when he was making movies like Bad Boys, Armageddon, and especially the rock. Those were the nineties, and nearly two decades ago, but even still, the man had his own style and ability. 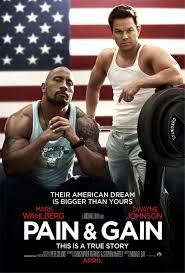 With Pain and Gain, Bay gets the opportunity to remind us of that. This is his first action movie that hasn’t relied on heavy special effects in over ten years. It’s not just that this isn’t a transformers movie, but also that it’s a realistic crime movie, not a futuristic crazy action movie (like his film the island, which was supposedly terrible.) so bay has this movie about a group of guys who work and hang out at a gym and decide to kidnap one of the older guys who goes there to work out. This is enough of a premise for bay to use in order to show us where his talents as a filmmaker lie. Mainly, he makes images look beautiful. This is the best-looking movie I’ve seen in a while. The colors pop off the screen. Back when bay was doing his thing in the nineties, his movies always had an orange skyline and also used orange filters. Characters looked like they were constantly sweating. The women never looked hotter and the guys never looked more muscular. This movie gets back to those kinds of basic images. The other thing bay can do, if given the right opportunity, is present characters, who are funny and semi-interesting. They are never anything unique or special, but the characters manage to be just charming enough that we want to stay with them. Think of Nic Cage’s Stanley Goodspeed in the rock. Here, in pain and gain, bay is able to tap into that a little bit by using voice-over to present us with the different points of view of each of the characters. The voice-over also helps add the right kind of humor into the movie, allowing us to know what people are thinking even when it doesn’t coincide with their actions. the problems really lie with the plot. the storyline to this movie is just too thin. a bunch of meat heads think that they can kidnap a guy and force him to sign over all of his property to them. then they think they can go in and run his businesses and act like the man just gave it all to them, and be done with it. they don’t think they will ever have to explain anything, or that there might be some complications and repurcussions for all this. all of that is pretty funny, and it’s exactly the reason why the first half of the movie works. the first half is all setup and the second half is all consequence. this is definitely a rise and fall movie, only the rise is never made to be as glamorous as it is in most other films., and the fall seems to just go on forever. maybe the problem is that all three of our heroes are absolute dumb-dumbs. you need at least one of them to be relatively normal in order to relate to him. here, we don’t get that at all. Mark Wahlberg plays the lead. he’s daniel lugo, a guy who buys into a self-help program (led by ken jeong), about being a doer and not a don’ter. he gets the idea into his head that he can be someone better than a fitness trainer at a gym. that’s too bad, because he got the job there based on a proposal he made to increase customer revenue and then he found ways to achieve his goal (free membership to strippers, because he knew guys would come to the gym to watch them.) so daniel is a hell of a salesman, and unfortunately, that’s not good enough for him. His friends aren’t any more intelligent. There’s Adrian, played by Anthony Mackie, and Paul, played by The Rock. These guys are both one note characters. mackie has problems with erectile performance. he gets help from a female doctor (Rebel Wilson), who he ends up marrying. The Rock is a drug addict religious freak. both characters are played for comedy, and it’s just too much. there isn’t a serious note to be found with either one of them. That’s okay, and manageable for a while, but when the story starts to lose whatever focus it had, it becomes even more apparent just how bad the humor is. maybe it just wasn’t as noticeable in the beginning, or maybe we get tired of it after a while, but the second half of the movie is too focussed on romantic relationships (both adrian and paul get involved with women), as well as downfall. everything spirals out of control and it seems to just go on and on that way. in some cases, the characters lost it all together and just go off the deep end. pain and gain is not a very good movie. there are likeable qualities to be certain, but when the story is weak, all the other components that don’t work so well are suddenly exposed. the movie looks great, as far as imagery, but that can only do so much. the humor is better than in most Michael Bay films, but that’s not really saying much. the biggest problem is that the story is a little too simple and not very creative. three guys decide to pull off a kidnapping. that parts fine. but the aftermath is where things start to feel way too familiar. this is definitely a movie that shows director michael bay’s talent when it comes to imagery, but boy does he need to work on how he tells a story, and maintaining the momentum he has going for him.